In 2012, dental caries was reported to be a major public health problem in most high-income countries such as the U.S. affecting 60% to 90% of school-age children and majority of adults in the country according to the world health organization. Dental laboratories are a mixture of art, science, and technology required for designing and manufacturing of products such as crowns, bridges, caps, veneers, and other orthodontic splints and appliances essential to protect and straighten teeth. Globally, increasing number of dental procedures, rise in the aging population, growing incidences of dental deformations, and increasing awareness about oral healthcare are the prime growth drivers of global dental laboratories market. In addition, growing demand for cosmetic dentistry and emerging economies such as China, India and others will create new opportunities for global dental laboratories market. However, lack of proper reimbursement, high operational cost, intense competition, and limited geographical reach are the key restraints for global dental laboratories market. 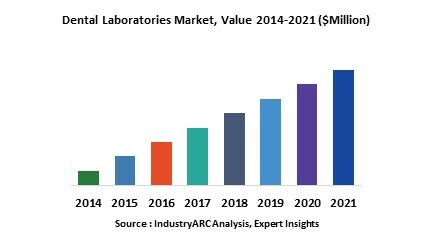 This report identifies the global dental laboratories market size in for the year 2014-2016, and forecast of the same for year 2021. It also highlights the potential growth opportunities in the coming years, while also reviewing the market drivers, restraints, growth indicators, challenges, market dynamics, competitive landscape, and other key aspects with respect to global dental laboratories market. Geographically Europe dominated global dental laboratories market followed by North America, due to number of community-based oral health programs being conducted across the European Union that focus on delivery of preventive treatment, increasing awareness, and enhance patient education. Asia Pacific is projected to have fastest growth, owing to rapidly increasing trend of dental tourism and increase in the number of laboratories established in the last five years, and increase in export demand for dental orthodontic, periodontics, crowns, bridges, and implants from emerging markets such as India and China. 13.8. Modern Dental Laboratory Co., Ltd.